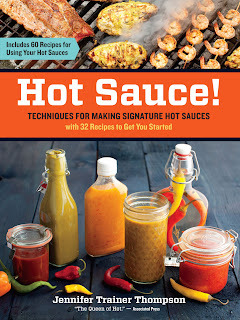 Don't Eat the Paste: Book Review: Hot Sauce! Jennifer Trainer Thompson knows her hot sauces. She's the creator of Jump Up and Kiss Me Hot Sauce, and she's written a few cookbooks as well as doing some travel and interviews specifically about spicy foods and sauces. If you love hot sauces and want to make your own, or if you just want to know a lot more about hot sauces, this is a fantastic book. It's written in a conversational, friendly manner with a history of modern hot sauces. Starting with Tabasco sauce of course, it's history and the products it inspired. Then it gets into the more edgy sauces with impolite names and funny graphics that are so searingly hot they have warning labels. There is art, history and side stories about the quest for heat, and a great chart with photographs of the different types of peppers used in making hot sauces. All very informative for the novice hot sauce maker, this is better than buying a kit because this is the information that will help you truly create your own recipe. She also explains how to bottle it for different applications, like just for personal home use or if you want to can it so it's more shelf stable for gifts or sale. The recipes cover a multicultural range of flavors with a bit about each sauce type to introduce the recipe. They start from a super simple recipe and get more complex with more ingredients. They have fruity flavors, other spices and bases of different ingredients. If your family loves hot sauce the way mine does, it's hard to pick a favorite. This part of the book is my favorite for 2 reasons. It gives you a good range of flavor profiles to get an idea of what you like and it has tips on creating your own hot sauce recipe. By trying the different recipes in the book, and developing your own feelings about what kind of sauces you like best, you can design one then based on what's regionally available. Then there are food and drink recipes to pair with your homemade hot sauces. If you like the idea of a spicy cocktail but dislike tomato juice, you might really love a Spicy Pineapple Margarita or a more simple spicy martini. Lots of condiment recipes from salsas to ketchup. Then comes a fairly extensive range of food recipes that are good with hot sauce. All the recipes include suggested hot sauces including some commercially available brands. The appendix has tips on developing your own brand if you want to make hot sauce for sale, and a resources list for the supplies and ingredients. This is a book that I happily recommend, and both my teens really like it as well. We are planning an Alaskan themed hot sauce in the near future.